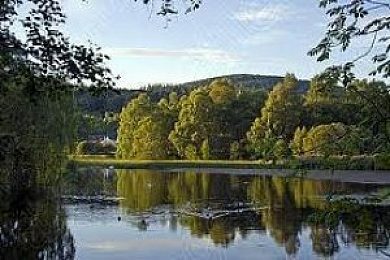 Aboyne Loch is located to the east of the Grampian town of Aboyne off the A93. Parking and permits are available from Aboyne Loch caravan park. The loch is essentially a horseshoe shape with the main swims found on the western side with the majority of swims accessed off the wall running parallel to the main road. The number of swims is limited to roughly 12 although there are plenty of swims available if you fancy a longer walk. On the east side there is a small bay off the road to the water-ski club which is shallow (3 foot) but provides a couple of swims although this can be weedy in the summer. The loch was stocked in 2002 and 2003 with roach, bream, ide and a few carp. These supplement the existing stock of perch, pike and eels. Mixed catches of the silvers can reach 40 lb with the roach and skimmers going to 1lb+ and ide to 2lb. The largest carp caught so far is 12lb with the pike being 30lb+. Given the shallow nature of the loch (average 4-6 feet) fishing is best from April to October with the pole being the main method in summer along with the waggler.